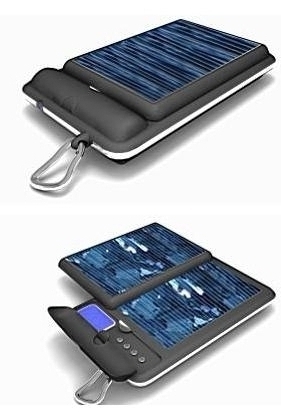 Caymeo multifunctional Solar Mobil Power is one of the new solar mobile power ranges. It has intellectual adaptable patented technology, can adjust the different voltage and the electric current and it is designed exclusively for laptop charging (also suitable for nearly all digital equipment with three independent output voltage lines) as emergency power supply. 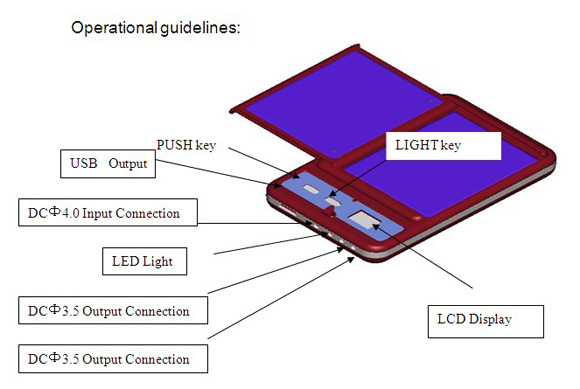 With a specific designed high performance LCD , you can even take it as a portable torch at night, which is handy for travelling. It is safe and compatible for your digital equipments, large capacity, small size and long running life. With this product, you will never need to worry about carrying all kinds of chargers for mobiles, PDAs, digital cameras and PSPs. it can take the knocks of every day life whether on a business trip to London, backpacking in the Scottish highlands or relaxing on a Caribbean beach. It can charge most of the laptops as well as other digital equipments including mobile phone, MP3, MP4, GPS, laptop, PSP, digital camera and most other digital products that are equipped with built-in chargeable batteries. We are constantly improving our products, developing new products and adding new features to our existing products in order to meet customer needs. We are flexible, if you did not see a product that what you are looking for, don't assume we can not do it, generally speaking, WE CAN.